Freight Rate Central provides shipping logistics to companies that need to move freight within Texas, interstate and throughout the US. Try one of our free instant online freight quotes right now and see the savings our advanced logistics system can provide. 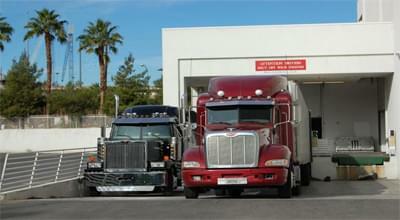 We can give you an estimate for a full truckload, less than a truckload or international shipping of goods. 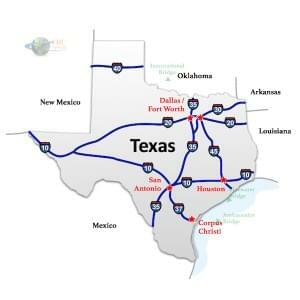 Below, you’ll find information and links that are relevant to Texas trucking. The Interstate Highway System is critical to Texas’s shipping infrastructure. Highways I-10, I-20, and I-30 cross the entire length Texas east and west and highways I-35, I-45 in the north and south directions. Highways I-37 and I-69 are major routes that connect various regions of Texas. The stretch of I-45 between Houston and Galveston, known as the Gulf Freeway, is an especially important route that handles the lion’s share of Texas goods bound for the sea. Keep in mind that I-35 and I-45, Texas’s two main north-south routes, are two of the most congested roadways in the United States. While these roads are well-maintained, the sheer volume of traffic makes them dangerous and slow-moving. Beyond that, hurricanes, tropical storms and the occasional tornado wreak havoc on the eastern half of Texas during the summer. Texas produces an astounding amount of export value. In 2013, revenues from Texan exports added up to almost 280 billion dollars. Manufacturing, agriculture, and energy are the state’s most important industries and not only are they profitable, they all rely on freight services. FRC Logistics, Inc. offers expertise in a vast array of freight shipping and trucking services, all of which are important to doing business in Texas. The oil, gas, energy, and supporting industries are the driving force behind Texas’s economy and are by far the most visible industries in the state. Exploration and drilling for crude oil and petrochemical refining are both critical Texan industries; crude and refined oil are some of Texas’s most profitable exports. However, renewable energy, especially wind power, is a major and growing part of the Texas energy sector. Wind farms and small residential wind turbines are commonplace. Texas is also a center for high-tech manufacturing, especially computers, semiconductors, aerospace components, vehicles and arms. As a result, raw materials and partially made components flow into Texas while completed planes, vehicles and computers go out. Agriculture makes up another one of Texas’s largest industries. Texas is probably most famous for producing beef and dairy—there are nearly 14 million cattle in Texas. In addition, Texas is a leading producer of crops like wheat, rice, soy, sugarcane, and grapefruit. Whether it’s meat or produce, food has to be shipped carefully to prevent spoilage, and FRC has the resources to help you do that. 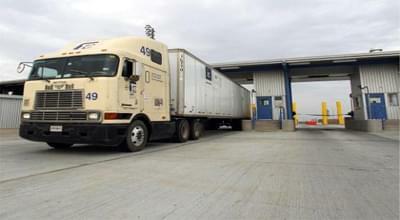 Research by the Department of Transportation found that 40 percent of the value of Texan exports went to other states and that Texas’s most important trading partners in the US include California, Washington and Illinois. In addition, Texas trades extensively with Mexico through the cities of Brownsville, Laredo, and El Paso. Texas’s ranching industry relies heavily on grain imports from Illinois and Ohio for livestock feed, so shipping between Texas and the Midwest is a thriving industry. Because of the Houston and Austin’s importance in the petroleum and tech industries, freight shipping from Austin to San Francisco and from Houston to Los Angeles are in high demand. The growth of the Southwestern tech industry has made Arizona an increasingly important trade partner. Above that size, they require permits.